As the number of connected devices in homes grow, and the paradigm of home computing moves to a more mobile base, Wifi connectivity has become increasingly important to a lot of people. Wifi offerings from ISP routers have long been less than ideal, using cheap commodity parts and constrained to a single location, often in a less-than-optimal position for good coverage. Home users have either battled dead zones, weak signal, or opted to try and fix it through additional access points or extenders. These devices too have been less than stellar in many cases. I've certainly cycled through enough standalone access points from the typical brands as one after another flaked out or died. Well, the industry has responded and the market is seeing a proliferation of so-called mesh network routers. Ostensibly, these offer multiple distributed antenna devices associated with a central access point/router that can be placed, and scaled, to provide good coverage throughout any home. Of course, we've long been able to do this by using multiple access points on the same SSID/authentication configuration (I have two APs in my setup), which devices will associate with automatically based on signal strength. The problem there is you really need wired ethernet to each location to do that effectively. The idea of the mesh routers, though, is that you can do this more easily and cheaply by allowing devices to 'hop' their signal between mesh points to a single router. It certainly does simplify the configuration involved, which is a boon for the less technically inclined. We'll focus on three good options here, and look at what each is offering at their respective price points. I've selected these as they are all good options with similar international availability. Stylish design is the order of the day with these devices intended to be out in the home rather than stuffed in a cupboard. First we have Ubiquiti, a relative newcomer to the home router market. We'll look at the offfering from consumer stalwart Netgear and, of course, 300 pound gorilla Google has a new product as well. Google is an interesting case here as the release of the Google OnHub stirred up the industry a bit, with Google providing the design but partnering with conventional manufacturers to produce a couple of different stylish models. The intent was to shake up router design and make them both smarter, and easier to set up. Google has now taken the plunge and released their own device, Google Wifi, in direct competition. So let's dive in. The Amplifi HD made it's appearance in the US in July 2016, from the less-well known network gear maker Ubiquiti. Ubiquiti came around in 2005 producing network gear for enterprise and SMB markets, specifically in under-served areas. More recently they branched into the consumer realm with this mesh Wifi offering. However, enthusiasts have been looking at their EdgeRouter range due to it's low price and comprehensive feature set as well. Physically, the Amplifi Mesh System comes with a Amplifi HD router and two mesh points. The router itself is a small rounded cube (now in black or white), with a glowing base, a circular color touch-screen display in the front, and 5 Ethernet ports on the back (4 LAN and 1 WAN uplink). The front display can be configured to show the router's IP addresses, throughput (within a given time period), date and time, or upload and download speeds. The mesh points are paddle shaped antenna units which connect directly onto a wall socket base via a magnetic ball joint. This allows them to be placed in any free power socket around the home, which may or may not be convenient depending on your wall socket situation. This approach does eliminate the need to deal with extra cables, however, and keeps the mesh points nicely out of the way. Coming from an enterprise pedigree, Ubiquiti has packed a lot of features and configuration into a smart looking smartphone app. The app simplifies the setup process by using BlueTooth to make the initial connection for setup. All that is required is to enter and SSID and password and you're up and running. Configuration without the app is also possible by connecting a PC (or tablet) to the ad-hoc network the router creates on startup. Once connected, you access the Amplifi through a web interface and run through the usual steps for configuring a typical home router. This method is obviously less user-friendly than the app, but doesn't take much more effort if going the DHCP route. The downside to that is the web interface is a bit basic, so if you have an objection to using the app this may be an issue for you. The Amplifi HD is a full featured router, supporting bridge mode, PPPoE, DHCP with static leasing controls, MAC cloning (for where your ISP connection is MAC based), port forwarding rules, a full firewall, and guest networks, all configurable through the app. Configuration options are limited however, for example you can only have a single DHCP scope, and firewall controls are limited to port forwarding rules. You can however use the band steering and router steering features to control where and how devices connect. 5Ghz devices can be steered to use that band by preference, or you can configure separate SSIDs on each band if you want to be sure, while router steering tries to get devices to connect directly to the base rather than the mesh points if possible. This is primarily to reduce latency if that's an issue for you. There are a few useful diagnostic tools too. 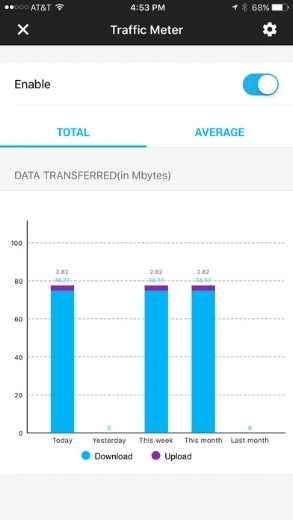 You can view throughput as a bar graph over the recent time period, plus current up and down values, as well as total upload and download usage. The app also contains it's own speed test functionality (upload, download and ping), with historical results similar to online speed testers. Finally, there is a diagnostic screen, which runs through some standard checks to ensure your configuration is set up properly (such as network settings, outbound connectivity, and the status of the mesh points). 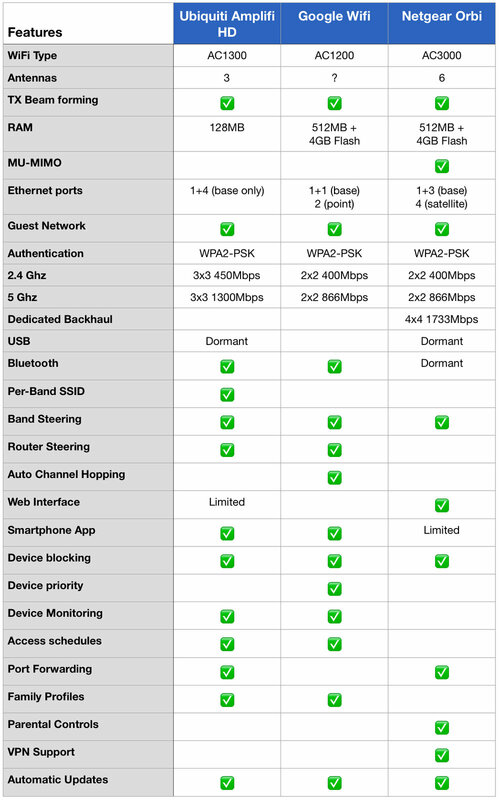 In terms of access control, Amplifi offers both a Guest network function, and Family profiles. The guest network is designed to provide some greater control by allowing you to limit the number of connections, and the time period it can be used. Handy for casual visitors, but the hard limit of 10 connections is a bit frustrating if you want to use it for IoT purposes. Family profiles allow for associating devices with specific family members, and then defining when particular people can access the internet using schedules. Alternatively, specific devices can be 'paused' to cut them off at will. The device display in the app provides useful info at a glance, including the band that the device is on, and it's current throughput. Looking at the details page of a device also provides useful info, such as the mesh point it's connected to, its up and down bitrate, and signal strength, along with the usual TCP/IP info. Find reviews of the Amplifi HD at BGR , GadgetReview, and a thorough one from MacWorld. Released in November 2016, Google Wifi ups the ante on their own OnHub device by adding mesh capability to the mix. Google's approach here is simplicity and flexibility with an extensible system. The router and mesh units are actually all the same device. You can get them in single or three packs, each being a small cylindrical unit with two Ethernet ports and a power adapter. The primary device allocates one of the Ethernet ports to the WAN uplink, while the rest are Ethernet connection points for whatever you need. While each unit needs a power brick and cable it means that you get a two port switch at each location, which can be quite handy. Features is where Google has taken a distinctly different approach to most router makers. Simplicity is the name of the game across the board. The devices themselves have no buttons, no displays, and no web interface. Only a single led strip around the center which indicates status as either 'good' or 'bad'. All control is through the smartphone app, and this requires a Google account. Supposedly this is to allow Google's cloud service to optimize your WiFi performance, and you do get some limited control of what is shared. The three options cover the automated assistance provided by the cloud service (you can turn it off), sending anonymous usage stats, and stats and crash reports from Google's Wifi app. Without any substantial interface to the device, setup is achieved by using the app to scan a QR code on the bottom of each point once the Point has been automatically detected. The use of the Google account is supposed to provide a security advantage by limiting access to the device to authorized accounts only. Additional Google accounts can be added as 'Managers' by sending them an invite. A manager can do most things in the app, but can't factory reset the network or add any new Points. Plus, any changes they make send a notification to the owner. This feature is a nice add for housemates or family members that need some control over devices on the network. Simplicity extends to the functions and configuration available as well. DHCP is the only option, and it's pre-configured to use a single address range, maybe that's an issue for some more advanced use cases, but most people won't notice or care. 2.4GHz and 5GHz bands are both used on the same SSID, no splitting option is available. DNS defaults to Google's own, but you can specify a different one if you wish. You have some limited control over the WAN settings in terms of automatic of manual configuration of IP settings. Plus, you do get the ability to create DHCP reservations and some basic port forwarding. These options would cover the needs of the vast majority of users, to be fair, but everything else is automated. What Google calls 'Network Assist' takes care of auto channel selection, auto band steering, and auto mesh point selection for each device based on signal strength. 'Industry-leading cloud-based security' is touted in the marketing material, but there's not much to go on as to what that actually means. What you do get is a NAT firewall, WPA2 security, auto-updates, and TLS secured communications back to Google HQ. Nothing there jumps out as particularly differentiating. Oh, and they've integrated control of Philips Hue smart lights...so there's that. The app itself is very nice, and is focused more on device management than router configuration. It's surprising how much control is ceded to the cloud service. If you internet connection is down, the vast majority of the app settings are grayed out, even though you're connected to the router via WiFi. Interestingly, you can only modify the WAN settings if the system is disconnected from the internet first. You can see the list of all connected devices (and you can name them to something meaningful), showing their speed and total throughput data up and down. These can be grouped into family profiles and then access can be enabled and disabled either manually or through schedules. Guest network creation is there, and as a standout you can provide access from the guest network to select devices on the internal network. Specific devices can be given network priority for 1, 2, or 4 hour windows, which is a nice way of handling gaming or streaming requirements. Finally you can do an internet speed test, mesh Point connectivity test, or device speed test, and remotely restart the mesh points, which is also handy. Update 20/Oct/17: Google has pushed an update enabling the use of Google SafeSearch to provide content filtering. This can be enabled on the pre-defined family groups as desired, so you can enable it just on the kids devices, or all of them. To start, it should be noted that the Orbi is not actually a mesh system. The satellite units (in Netgear's parlance) only communicate with the central router, not with each other. However, as the international availability of the Orbi is on par with the other two products, and Netgear is marketing it as a mesh solution it seemed prudent to cover it. In terms of WiFi coverage and speed, it actually performs very well, so it's not a substandard offering in this space. Physically, the Orbi units are on the larger side, but stylish in design as with the others. Both the router and satellite units are shaped like an artistic vase in white, with the top either blue or white depending on whether it's the router or satellite respectively. The rear has 4 Ethernet ports, 1 of which is the WAN uplink on the router model. Buttons are present for Sync, Power and reset (pin hole), and the units have USB and Bluetooth, although neither is actually functional at this point. Instead of a mesh protocol, the satellites (you can have up to 3) connect to the router via a dedicated 5Ghz channel which provides for ample throughput (rated at 1733Mpbs). Both a typical Netgear router web interface and a smartphone app are available, and either can be used for initial setup. Once the router itself is connected (indicated by a glowing white ring around the top of the router unit), the satellite can be connected by pressing the 'Sync' button. The satellite also sports a light ring around the top which changes color depending on the signal strength. This makes it easy to position the unit within optimal range of the base unit. The web interface provides a raft of tweaking options, including DHCP IP reservations, manual DNS configuration, VPN settings, port forwarding, and even creating static routes. You can also manually disable specific devices network access (wired or wireless), block specific ports and services, and configure the guest network and remote management for outside access. Access to update the firmware and various advanced Wifi settings can be found through some digging around. The Genie app offers a subset of these options, so you'll need to use the web interface for any serious configuration management. There is a parental controls section, but it doesn't offer the family profiles or scheduled access of the other products. Rather it uses OpenDNS provided site filtering, which requires setting up a free account in order to customize your block list. As an interesting bonus, NetGear had advised they were working on Alexa integration at launch, and has reportedly now enabled some limited Amazon Echo support allowing a few things like turning on the guest network and rebooting the router. I'm not sure how much of a gimmick this is, but it's certainly a differentiator at this stage. These three products are up there as the best on the market. All offer excellent coverage and performance, although if performance is your focus I'd refer you to the linked reviews to get a good cross section of testing. Your mileage will vary due to the number of variables. The interference sources in your home and neighborhood, the construction and layout of your home, and even the placement of your furniture can have an effect, so this is hard to be objective. Overall though, these options each have something unique to offer.